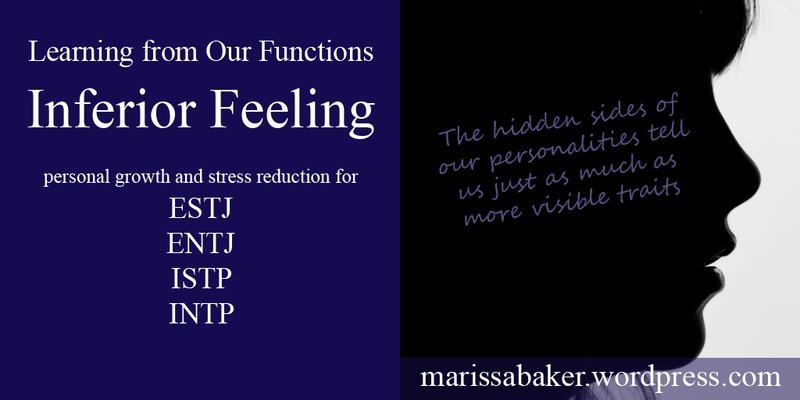 If we’re describing someone’s personality type in the Myers-Briggs system, we usually talk about their primary and secondary “functions” (also called mental processes). An ISTP, for example, leads with a process called Introverted Thinking (a judging/decision making function), which is supported with Extroverted Sensing (a perceiving/learning function). An ENTJ, on the other hand, leads with Extroverted Thinking, supported by Introverted Intuition. Using Personality Hacker’s car model,* we can compare our primary function to an adult driving a car, and the secondary function to a second adult navigating in the passenger seat. Each type also has a tertiary function (the opposite of their secondary function), and an inferior function (the opposite of their primary function). These are less well developed. In the car model, our tertiary function is like a 10-year-old sitting behind the co-pilot, and the inferior function is like a 3-year-old sitting behind the driver. The processes you use most readily are the ones typically visible, and they define your personality as others usually see it. Our less developed functions play a significant role as well, though. Today, we’ll be looking at types which use Feeling as an inferior function. 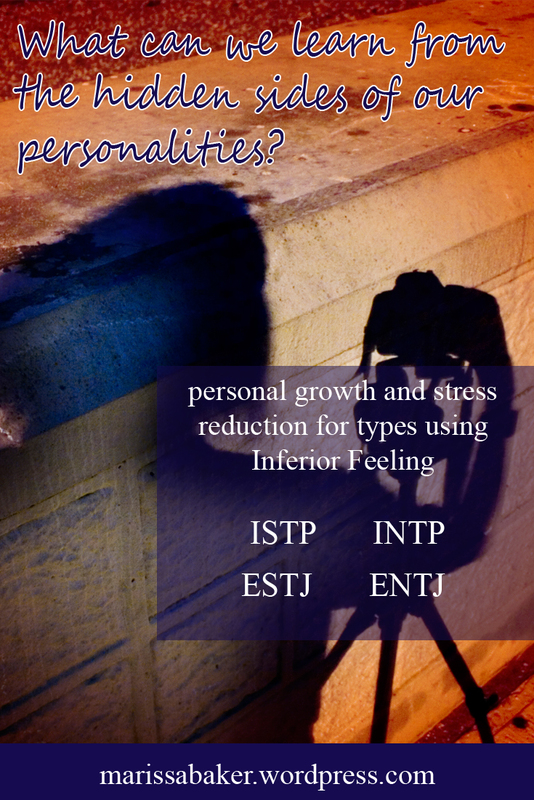 As with other types, ISTPs, INTPs, ESTJs, and ENTJs do use their inferior function in everyday life. They use Thinking for most decision-making, but Feeling still shows up in several ways. For Extroverted types, it often influences the causes they champion and/or is connected with their religion. Their Feeling function helps them connect with the human community and drives them to contribute in a way that meshes with their sense of authentic self. Introverted Thinking types are often (unfairly, I might add) stereotyped as areligious, coldly analytical and unconcerned with other people’s feelings. They can come across that way, but they really do have a feeling side. ISTPs and INTPs can be deeply spiritual and they value their friendships just as much as dominant Feelers do (though they often have fewer close friends and aren’t as comfortable expressing emotion). ISTPs and INTPs also lead with a thinking function, in this case Introverted Thinking. This makes Extroverted Feeling their stress function, and it looks different than the Feeling used by ENFJ and ESFJ types. Here are the traits Quenk associates with inferior Extroverted Feeling (and their counterparts in Fe-dominant types). When stressed out, both introverted and extroverted types which use inferior Feeling are hypersensitive to anything having to do with understanding their own or other people’s emotions. They often misinterpret other people’s intentions, seeing them as overly critical and judgmental. They might become distressed, anxious and annoyed, but this won’t be readily apparent from the outside (Quenk p. 130). Because Thinking types are often uncomfortable expressing their feelings, they still struggle to maintain an appearance of control when stressed-out. To make up for being unsure how to express what they’re struggling with, stressed Thinkers may excessively focus on logic to counteract feelings of uncertainty and being overwhelmed. From the outside, they start to look short tempered and unreasonable. When pushed far enough (either by an external stressor or something going on inside their minds), Thinkers may blurt out their own feelings in a way that seems totally out of character. ESTJs and ENTJs, especially women, often say that losing control and crying in public or lashing out in anger is typical of their “grip experiences” (Quenk p. 84). For some INTPs and ISTPs, an “intense expression of emotion” can actually help them deal with stress and be the push they need to back to normal (p. 140). Both the introverted and extroverted thinkers need plenty of alone time to process their feelings when dealing with stress. This is particularly important for ISTPs, INTPs and ENTJs (one of the most “introverted extroverts”). Whether or not they want to talk about it with a friend varies from person to person. One thing that’s consistent, though, is that they don’t want someone trying to fix things for them or pressure them to open up. Other people are most helpful if they can act as a low-pressure sounding board. Naomi Quent reports that ESTJs and ENTJs experience “very few or quite minor eruptions of their inferior function” compared to other types (p.92). Often, finding a distraction through entertainment or a change of scenery is enough to bring them out of their stress function. Physical activity, a change of scenery, and “light problem solving … such as reading a mystery novel” can also help INTPs and ISTPs (p.140). For many people, the side of their personality that’s related to their inferior function stays a mystery throughout their lives. Type theorists say that most people who successfully incorporate their inferior function typically do so around middle age. However, Isabel Meyer suggested that every type exercise all their functions on a regular basis when making decisions. Dominant Thinking excels at impersonal analysis, predicting cause and effect, and considering the cost involved in any decision. Incorporating Feeling adds a people-oriented level that checks decisions against your personal values and take into consideration the good other people (Meyers, Gifts Differing *, 197). According to Naomi Quenk, ESTJs and ENTJs who successfully use their Introverted Feeling learn to value relationships highly. They (occasionally) loosen their high standards and cut themselves and others a little slack (p. 94-95). Much the same thing can happen for INTPs and ISTPs, who become increasingly sensitive “to the nuances of important relationships” and learn to express and accept their emotions more readily (p. 141-142). Very accurate, (for both me and my husband, INTP & ENTJ) especially about the misinterpretation of others’ intentions. I often guess what someone means but only as one possibility in a hundred (thanks to Ne) and panic, because I don’t know whay to do and I suddenly might find myself caring a lot. My biggest problem with inferior Fe is that I am almost autistic-seeming sometimes because I don’t really grasp my emotions or anyone else’s in time to react to things appropriately. It can take days for me to realize I am upset about something, or even years in some cases. Furthermore, it can takeme a while to recognize that someone else is upset and usually I don’t know what to do about it when I do. I feel fake and awkward trying to help and insensitive if I don’t. Sometimes I pretend not to notice. I also have the traditionally male issue of always solving problems instead of listening lol. I believe my head pastor is an INTP also. He delivers the best messages I have ever heard, but he is not very sociable at all lol.